James Campion on the Rock School radio show! Author of Shout It Out Loud: The Story of KISS’s Destroyer and the Making of an American Icon, James Campion, spoke with Professor Joseph Burns of the radio show ‘Rock School’. They talked about the book and the influence that KISS had over time. Click play below to learn more about what they had to say! For more than 40 years, the rock band KISS has galvanized the entertainment world with an unparalleled blitz of bravado, theatricality, and shameless merchandizing, garnering generations of loyally rabid fans. But if not for a few crucial months in late 1975 and early 1976, KISS may have ended up nothing more than a footnote. 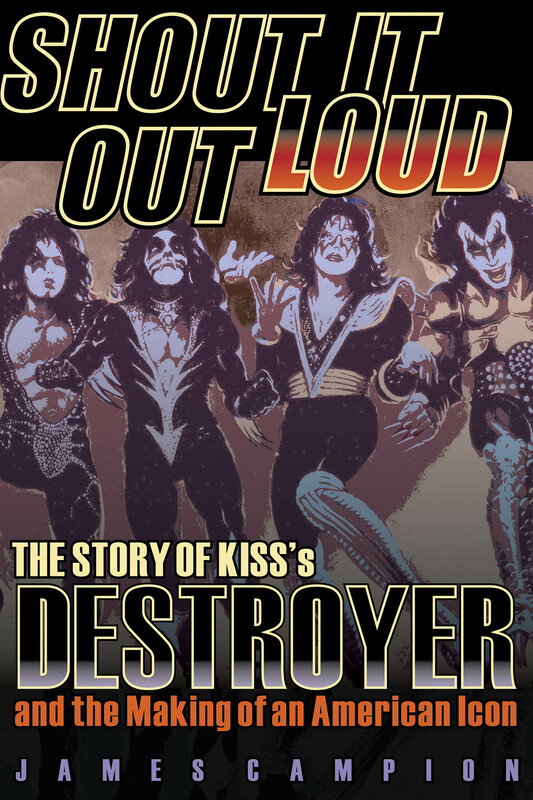 Shout It Out Loud: The Story of KISS’s Destroyer and the Making of an American Icon by James Campion (October 2015, Backbeat Books, $24.99) is a serious examination of the circumstance and serendipity that fused the creation of the band’s seminal work, Destroyer – including the band’s arduous ascent to the unexpected smash hit, Alive! ; the ensuing lawsuits between the band’s management and label; the pursuit of the hot, young producer, Bob Ezrin; a grueling musical “boot camp;” the wildly creative studio abandon; the origins behind an iconic cover; the era’s most outlandish tour; and the unlikely string of hit singles. Extensive research from the period and insights into each song are enhanced by hundreds of archived materials and dozens of interviews surrounding the mid-’70s-era KISS and its zeitgeist. Campion’s new interviews with major behind-the-scenes principals in the making of an outrageously imaginative rock classic animate this engaging tale. Shout It Out Loud is the story of how an underground rock and roll oddity became a cultural phenomenon. James Campion on 93 Rock FM! James Campion, author of Shout It Out Loud: The Story of Kiss’s Destroyer and the Making of an American Icon, was featured on WIMK Radio! Watch the video below to hear what he had to say! Shout It Out Loud is a serious examination of the circumstance and serendipity that fused the creation of the band’s seminal work, Destroyer – including the band’s arduous ascent to the unexpected smash hit, Alive!, the ensuing lawsuits between its management and its label, the pursuit of the hot, young producer, a grueling musical “boot camp,” the wildly creative studio abandon, the origins behind an iconic cover, the era’s most outlandish tour, and the unlikely string of hit singles. Extensive research from the period and insights into each song are enhanced by hundreds of archived materials and dozens of interviews surrounding the mid-’70s-era Kiss and its zeitgeist. New interviews with major principals in the making of an outrageously imaginative rock classic animate this engaging tale. James Campion on All Access with Rick Stuart! James Campion, author of Shout it Out Loud, was on All Access with Rick Stuart! They talked about the book and answered questions sent in from the listeners, in this unique and informative podcast. Click on the link below to listen, and let us know what you think! Shout It Out Loud: The Story of KISS’s Destroyer and the Making of an American Icon by James Campion is a serious examination of the circumstance and serendipity that fused the creation of the band’s seminal work, Destroyer – including the band’s arduous ascent to the unexpected smash hit, Alive! ; the ensuing lawsuits between the band’s management and label; the pursuit of the hot, young producer, Bob Ezrin; a grueling musical “boot camp;” the wildly creative studio abandon; the origins behind an iconic cover; the era’s most outlandish tour; and the unlikely string of hit singles. James Campion talks KISS with Eddie Trunk! James Campion, author of Shout It Out Loud, was Eddie Trunk’s guest on SiriusXM. They talked about the book and traded stories about their early memories of the band. Listen to the podcast ! For more than 40 years, the rock band KISS has galvanized the entertainment world with an unparalleled blitz of bravado, theatricality, and shameless merchandising, garnering generations of loyally rabid fans. But if not for a few crucial months in late 1975 and early 1976, KISS may have ended up nothing more than a footnote. James Campion, author of the book, Shout It Out Loud, was featured in the Detroit Free Press over the weekend, focusing on his quest to solve the mystery behind the classic song, “Detroit Rock City.” Read more about it below! “Detroit Rock City” has become an anthem around these parts, a hard-rocking, much-loved Kiss classic whose title gave the Motor City another enduring nickname. And here’s something you probably didn’t know: That 1976 track, a tribute to Kiss’s favorite concert town, seems to have been inspired in part by a tragedy far outside Michigan, for years shrouded in mystery. Nailing down that vexing detail has become an obsessive, ongoing quest for author James Campion, whose just-published book, “Shout It Out Loud,” chronicles the making of the band’s iconic “Destroyer” album. As the veteran New York journalist readied his final manuscript earlier this year, he realized there was one crucial factoid he’d not yet tracked down: What was Paul Stanley referring to when he said that “Detroit Rock City” was based on a fatal fan wreck after a Kiss show in the Carolinas? Read the whole story over at Detroit Free Press! James Campion speaks with Kiss FAQ! James Campion, author of Shout It Out Loud: The Story of KISS’s Destroyer and the Making of an American Icon, spoke with Julian, one of the board members of KISSFAQ, about his book. Listen to the podcast below to learn more about James Campion’s book! In this exclusive interview excerpt, Shout It Out Loud author James Campion discusses the legal imbroglios that halted (and nearly derailed) the Destroyer sessions with Larry Harris, the Vice-President of Casablanca Records! Photographer Bob Gruen speaks with author James Campion, author of Shout It Out Loud! In this exclusive interview excerpt, legendary photographer Bob Gruen, speaks with Shout It Out Loud author James Campion. They discuss the significance that KISS’s makeup had with making them who they are now. Watch the video below to learn more, and let us know your thoughts in the comments below. Author James Campion speaks with graphic designer Dennis Woloch! In this exclusive interview excerpt, iconic graphic designer Dennis Woloch discusses the artistic and cultural context of Destroyer’s cover with Shout It Out Loud author James Campion! Watch the video below to learn more, and let us know your thoughts in the comments below.